Being a homeowner comes with a lot of responsibilities and tough choices. Unfortunately, some of the decisions you may be making in your home can actually be costing you quite a bit of money. No worries, we are here to help you identify some of the most expensive mistakes made by homeowners and how to correct them. 1. Ignoring That Dripping Faucet. How much d amage could a small drip or leak really do? A lot more than you might think! You can waste up to 265 gallons of water per day, depending on how fast the faucet is dripping. This much water waste can really add up on your monthly water bill. Have dripping faucets and other leaks fixed right away to prevent your hard earned money from going down the drain! 2. Allowing Leaky Doors and Windows. Doorways and windows require regular maintenance to help ensure that you are not wasting extra money on heating and cooling. To save money on your heating bill, it is important to make sure that your doorways and windows are properly sealed and caulked around the edges. 3. You Are Still Using Incandescent Light Bulbs. Traditional incandescent bulbs require a greater amount of energy than more efficient models. You can see real savings on your power bill each month by switching to LED and energy efficient CFL bulbs. 4. Treating Your Air Filter like an After Thought. Using the wrong size air filter or forgetting to change it regularly will force your he ating and air conditioning system to work much harder, increasing the amount of money you are spending on your power bill. Additionally, failing to properly maintain your air filter will damage your heating and air conditioning system over time, causing costly repairs and shorten the system’s lifespan. 5. Failing to Properly Adjust Your Thermostat. your specific comfort desires. However, there is no need for you to be wasting money on keeping your home at the perfect comfortable temperature when you are not there to enjoy it. You can see real savings by simply adjusting your thermostat 10 degrees before leaving for work. Not to worry if you are not a fan of the idea of coming home to an uncomfortable house or you do not want to have to worry about adjusting your thermostat each morning. Wifi and programmable thermostats are great options if you want the power to control your temperature settings when you are not at home. Contact us today to learn more about the benefits of upgrading your thermostat. 6. Your Water Heater Settings Are Higher Than They Should Be. Traditional water heaters, versus tankless water heaters, store and heat water around the clock. Which means your water heater is almost constantly using energy to keep a large tank of water heated and ready for use. So, if your temperature is set higher than it needs to be, you are wasting money needlessly. We recommend a water heater setting between 110-115 degrees to save you money on your power bill. You may also want to consider upgrading to a tankless water heater to save even more money. Give A Toy and Help Us Support Our Local Toys for Tots Chapter! Once again this holiday season, Tiger Plumbing, Heating, Air Conditioning & Electrical Services will be collecting NEW, unwrapped toys for our local Toys for Tots chapter. 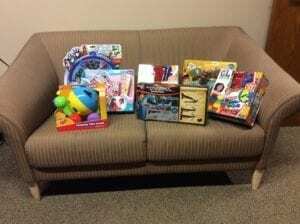 The toys we collect will be donated to needy children in the Metro-East area. Last year we collected over 140 toys and, with your help, we can blow our old record out of the water! 2. Books for Kids of All Ages. 4. Unopened Bath Gift Sets. 6. Dolls and action figures. For more information please visit the Toys for Tots Website. With your help, we can work together to make the holidays a little brighter for the children in our area. For more information on how to donate, or to have any other questions answered, please call 1.888.9TIGER4, or feel free to check us out online at TrustTiger.com.